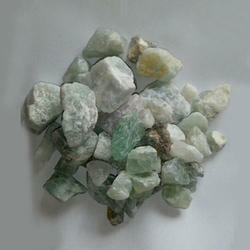 Offering you a complete choice of products which include fluorspar lump. The Flourspar Lump offered by us is sourced from trusted and reliable organizations. Formulated as per international quality standards, these are pure, safe and have long shelf life. These are as a flux for smelting metals and help to reduce various impurities as silicon, sulfur, and phosphorus. To retain the property of the chemicals, these are hygienically packed using quality material. We are looking for the queries from Eastern India and West Bengal.